There’s something magical about Billy Eichner yelling in your face, and David Letterman is the latest celeb to subscribe to the Church of Billy Eichner Yelling in Your Face. The boisterous comedian who is best known for his unique way of quizzing the people of New York on their knowledge of pop culture trivia made his first appearance on The Late Show with David Letterman on Thursday night and though Letterman announced his retirement earlier this year, I sincerely doubt Eichner’s first appearance will be his last. As they both strapped in to play “Celebrity Child or Kentucky Derby Winner?” Letterman said quite matter-of-factly, “Let’s play a game and you scream at me and stuff.” Sure, Letterman understood the nuts and bolts of what it’s like to play one of the many challenging and dollar-filled Billy on the Street quizzes, but I don’t think he quite knew what he was in for. Once that 30-second clock started ticking, Eichner went into full-on Eichner mode and the results were hilarious. 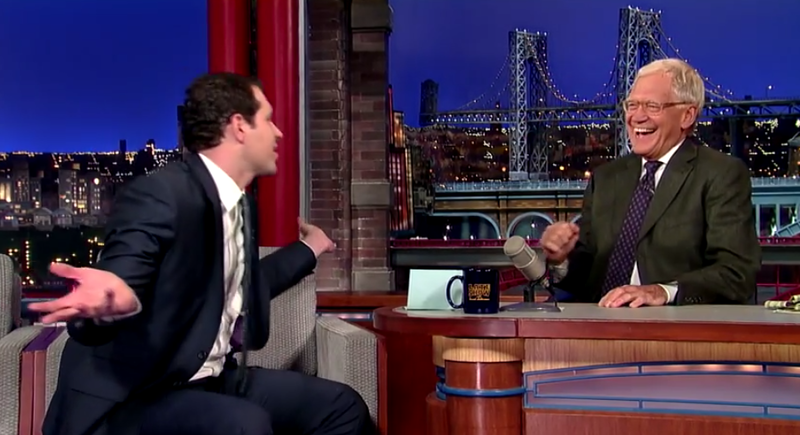 There was also something particularly endearing about the way Letterman admired Eichner and asked to keep playing because he was just having so much fun. It was also touching to see these two comedians together, as Eichner credits Joan Rivers for first telling Letterman about his talent and jump-starting his career. By the looks of things, this won’t be the last time these two work together. Okay, I'm having fun now! I got a question right! I am as excited as I am terrified! Stumped. Wait, is he going to yell at me again? I wish this was my show! ...is yelling WITH Billy Eichner. Watch the entire hilarious clip with bonus "Dead or Boring?" round!